Gewürztraminer is a white-wine grape with a complex history. 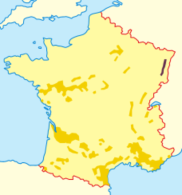 Though now closely associated with Alsace (see map at left), it apparently originated in the Germanic South Tyrol province of Italy as "Traminer", a forerunner type still important (usually today under the name Savignan Blanc, to avoid confusion with Gewurz, as the wine is now often called). At some point, Traminer threw a mutation (wine grapes are quite prone to mutation) with much stronger aromatics, and that variety was soon known under many names, quite a few of which still survive (see "Synonyms", above). In time—say by the later 1800s—the settled name became "Gewurztraminer" (originally spelt without any umlaut). Gewurz is generally considered one of the dozen and a half or so of world-class white-wine grapes (those in boldface in the dropdown varietals lists above). An extremely common but erroneous remark one finds about the wine is that the prefix "Gewürz" means "spicy", and from that evolve remarks about the wine's "spicy" flavors; in truth, a much better translation would be "perfumed", and that shows in some of the other names for the grape (Traminer Aromatique, Traminer Musqué, Traminer Parfumé). While the wines typically have strong and somewhat exotic flavors, few if any of them actually correspond to the aromas or tastes of any actual spices. As you will see below, descriptions of the nose and taste of gewurz tend to be remarkably similar. The most frequently repeated simile is "lychee" (aka "lichi"), not necessarily an aroma many will be intimate with. One also reads of tropical fruits, floral notes, and that elusive "spiciness". In fact, there is no good way to put the wine's quality into words; but one's first two or three samples will leave an indelible impression. Gewurz is a grape quite difficult to grow well; it is very sensitive to soil type and climate, and—though a vigorous grower—prone to diseases. As relates to the wine produced, the important aspects of viticulture are that, because the grape has naturally high sugars but rather low acids, in warm climates it tends toward flabby wine lacking sufficient acid to balance the sweetness, whereas if picked early to retain some acid, it may well not have developed enough of its famous characteristic flavor elements. In general, then, getting Gewurz with the full flavor balanced by sufficient acids is very tricky, and so a lot of mediocre Gewurz gets made. Only the top hands can reliably produce good product on a long-term basis. It is received wisdom, and (for once) probably correct that the best manifestations of Gewurz are and for some time have been the Alsatian wines (that is also true of such similar wines as Riesling, Pinot Blanc, and a few others). There are some makers in California who are said to have achieved satisfactory results, but by and large the wine world still turns to Alsace for its Gewurz. Factoid: Frankisch in Austria, Gringet in Savoie, Heida in Switzerland, Formentin in Hungary, and Grumin from Bohemia are all very similar to Savagnin blanc and probably represent clones of the Traminer family, if not Traminer itself. Viognier may be a more distant relative of Savagnin blanc. "The variety has high natural sugar and the wines are white and usually off-dry, with a flamboyant bouquet of lychees. Indeed, Gewürztraminer and lychees share the same aroma compounds. 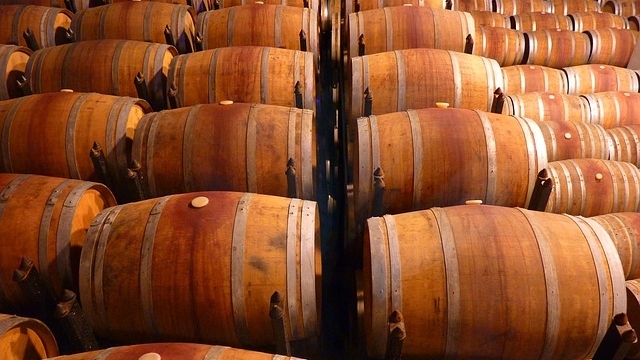 Dry Gewürztraminers may also have aromas of roses, passion fruit and floral notes. It is not uncommon to notice some spritz (fine bubbles on the inside of the glass)." "No other region in the world can match Alsace for explosively spicy, fruity gewürzes. A good Alsace gewürztraminer combines aromas and flavors of citrus and tropical fruits, rose petal, lichee, sweet brown spices (the gewürz prefix in German means spicy) and grilled bacon or smoked meat. While some wines tend to be more floral and others more fruit-driven, most examples of both types are spicy, aromatic, flavorful, low in acidity and rather full-bodied. Floral gewürzes are usually lighter and more delicate while fruitier versions are more often thick, even oily in texture." "It is not a subtle wine, it is distinctive and its special quality sets it apart from all other white wines. Because of the intense aroma and strong flavor some people have difficulty enjoying it with food. Gewurztraminer is known for being very crisp and spicy. While it has varying degrees of sweetness and dryness, this wine is distinct in its aromas, colors and flavors. The wine is full bodied, which is rare in white wines. It has characteristics and flavors of flowers specifically roses, gardenias, honeysuckle; and fruits such as grapefruit, peaches and mangos; and spices like nutmeg, cloves, ginger and vanilla. Gewurztraminer has also been noted for its musky or earthly flavor, while others suggest that the flavor is more herbaceous, grassy, sometimes with a hint of asparagus. Although there are many descriptions of Gewurztraminer, most will agree that when you taste Gewurztraminer it tends to be both sweet and spicy at the same time. People tend to either really love Gewurztraminer or stay far away from it because its intensity can be overwhelming. - See more at: http://www.grapeheaven.com/learn/Gewurztraminer-i58.aspx#sthash.rRuTZCVI.dpuf"
"Gewürztraminer can be made in many styles and for many purposes. It can range from dry, to sweet, to fortified to sparkling. It can also be used for blending. Most of the Alsatian versions are dry (trocken) or semi-dry (halb-trocken) and both types are good. Dry Gewürztraminer, with no residual sugar, is best served alongside Oriental or Indian cuisine, with which it matches up very well. The wide range of exotic flavors in the food complement Gewürztraminer’s flavor and aroma. Sweeter versions, with three percent or more of residual sugar, are best served as a dessert wine with sweet pastries and fruit cream dishes. Slightly sweet Gewürztraminer — which weighs in at between one and a half to three percent of residual sugar — can be delightful with sweet, cream foods or some cream desserts." "Most Alsatian Gewurztraminer wine is a dry or just off-dry white wine. However, some late harvest wines can be quite sweet. . . Gewurztraminer can have a flamboyant personality which people either love or are put off by. First of all, it tends to be very aromatic with dramatic aromas of rose petals and lychee fruit jumping from the glass. The flavors tend to be bold, full-bodied and often have a spicy accent to them. They can seem almost waxy or oily because of their full body and relatively low acid. Yet, despite the lower acid and rounder, fatter texture, the best Alsatian wines stay in excellent balance. They do not have the thrust and verve of a Riesling and almost represent a polar opposite in terms of personality. Most Gewurz is excellent young but some can age well too. While they do not have the longevity of Riesling, they can improve in bottle for many years." "It is often described as having the small of roses or Lychees but not in subtle way. A strong sniff of Gewurztraminer often results in an olfactory overload. It taste is equally polarizing. Gewurztraminer is a low acid Varietal so in most cases, there really isn't a counterbalance to a sweetness that can range from subtle to overpowering. While many sources describe it as full bodied white wine, in reality that full body character can also produce a cloying sweetness that overwhelms the other characteristic of the wine. The best examples are subtle with a balance of perfume, crispness and spice. If either the vineyard master or the winemaker makes a mistake with Gewurztraminer it can't be hidden. For those who grow Gewurztraminer, it's a labor of love because it's a very difficult grape to grow. It ripens early so an onset of late rain or cold can cause problems. Cool, dry climates allow what meager acid is present to mature. 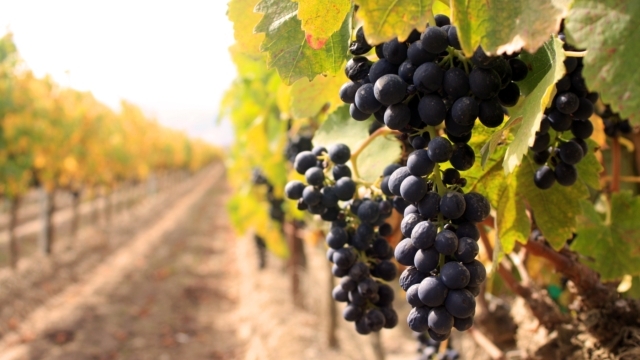 In warmer climates, it quickly ripens with little acidity or complexity. Like most wine grape varietals, it will over produce if not kept in check, which weakens the fruit flavors. Its grape color can range from green, to yellow and even orange, usually depending on climate." "Gewürztraminer is a pink-skinned, small-clustered grape variety that sets a modest crop and ripens fully in propitious, cool-climate conditions, producing heady, alcoholic, dry table wines . . . Gewürztraminer is justly famed for its wonderfully exotic, complex aroma, which is reminiscent of roses, lychee fruit, allspice, peaches, and grapefruit. " "Gewürztraminer is one of the most pungent wine varietals, easy for even the beginning taster to recognize by its heady, aromatic scent. . . "Gewürztraminer is highly perfumed and quite full-bodied, more so than all other white wine grapes, with the exception of Viognier. In fact, the combination of Gewürztraminer's strong, heady, perfumed scent, exotic lychee-nut flavor and heavy-oily texture can be overwhelming and tiring to many palates. There is also a slight tendency to bitterness that seems exacerbated by ripeness, so a light touch is needed at the wine press. Many makers finish their Gewürztraminer with a spot of residual sugar. . . The most frequently encountered (but not exclusive) smell and/or flavor elements found in Gewürztraminer-based wines include: Floral—rose petal, gardenia, honeysuckle; Fruity—lychee, grapefruit, peach, mango; Mineral—petroleum, terpene, diesel; Aggressive—perfume, spice. "Gewurztraminer [is] probably the world's most distinctive white table wine. For most wine drinkers, Gewurztraminer is a love/hate wine because its bold, exotic perfume reminiscent of cinnamon and cloves, litchi and rose petals, its full-bodied texture and prominent spicy flavors can be too extreme for some. The varietal possesses these characteristics regardless of where it is grown, but Alsatian vineyards produce by far the truest version of Gewurztraminer. What makes Alsatian Gewurztraminer superior to all others? Primarily soil, hillside elevation and exposure, a perfect microclimate and older grapevines." We have tried to include an international sampling of Gewurz wines, but those in their most familiar home, Alsatia, are now simply too pricey, even at the "entry level", for these lists. Beware sweetness levels: supposedly "table wine" Gewurz can range from bone-dry to quite a ways "off dry"; none are accordingly "better" or "worse", but your appreciation will depend mightily on your preference for dryness in non-dessert wines. ♦ The aromatic intensity takes you quickly to the signature heart of the grape. It's floral and spicy, leading to concentrated flavors of citrus and stone fruits. It's ripe, dry and penetrating. 90 points, a "Best Buy". ♦ [A] delicate and dry white wine that displays plenty of floral and spice aromas. A bouquet of sweet peas and rose petals greets you on the nose and perfectly complements the lush palate. Flavors of peach and nectarine are bright and playful on the palate, with just the right amount of intensity. Impressions of honeydew melon linger on the tongue, complementing the opulent texture of the wine. The finish is dry and refreshing. 90 points. ♦ The wine is a pale yellowish straw color. The fresh and exotic smelling nose has lychee, apple, pineapple, orange zest, nice spice, and rose petals. This is light to medium body with crisp acidity and just a hint of sweetness, even though it is labeled as dry. An almost oily texture on the palate accompanies nice spicy, fruit laced, lychee with come citrus in the background. The finish shows nice length with the spicy citrus hanging on and slowly dissipating. This is as good as this one will get, so I’d advise drinking up before the colder seasons roll around since this started fading after a couple hours. 89 points. 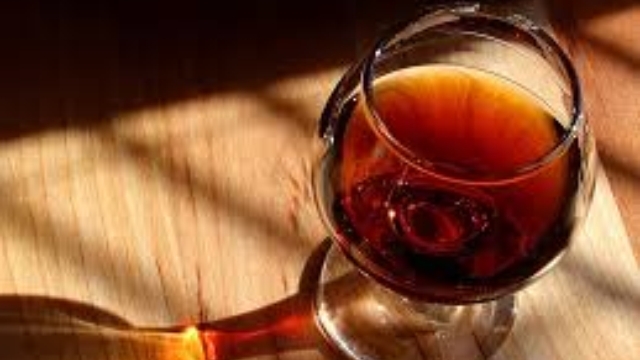 ♦ In the glass the wine was medium light in color – not completely clear, but certainly not a rich golden color either. On the nose I got hints of honey and a touch of citrus with a roundness that spoke of spice that I just wasn’t getting personally. In the mouth the wine was subtly sweet, with good citrus notes and a bit of body on the finish…I’m not going to go out and say that this is the greatest, or driest Gewurztraminer that ever was, but if you’re as gun-shy around the grape as I am it’s not a bad choice to try and ease your way back into it until you get to the really dry choices that you won’t believe are Gewurztraminer. ♦ Whether or not you are inclined toward the grape, this is a must-try bottle. Dry without being austere, it starts with a berry generosity featuring bright, almost hop-driven flavors. It smoothes out with notes of mineral and citrus, and a wonderfully refreshing finish. 90 points, Best Buy. ♦ Delicate aromas of sweet peas and rose petals telegraph the floral qualities of the wine and lead into the peach and nectarine flavors that fan out across the palate with moderate intensity. Lingering flavors of Honeydew melon complement the lush texture of this dry wine and punctuate the refreshing finish. ♦ It’s a dry Gewürztraminer, yet it’s so floral and sweet…It’s not a sugary sweet, but a delicious and balanced combination of fruit, acidity, and spice. I feel quite heady after having it…Trust me, you have to try it yourself to believe it. ♦ Such a reliable wine from the experienced hand of Paul Cluver. There is some residual sugar (10.3 grams per litre), although it is not cloying. The wine is elegant with a nice intensity, showing very attractive notes of apricot and peachy fruit, with some lychee and hints of rose petal. Love the freshness and vivacity. 91 points. ♦ For sheer value, however, the most impressive gewürz’ I’ve tried recently comes from the cool-climate Elgin region of South Africa: made by Riesling specialists Paul Clüver, it has zip and lift to go with the ginger and rose perfume. ♦ Lovely aromatic, Turkish delight and lychee nose leads to a fresh, textured palate with attractive, pretty fruit. Dry and crisp with lovely balance. 90 points. ♦ [Google-translated from Italian:] Crystalline, Pale yellow and alive. Discreetly intense and persistent but fine, with floral, fruity and spicy notes of yellow peach, wheat, honey, wisteria, anise and nutmeg. Sufficiently fresh but very sapid, full but slender, persistent with balsamic aftertaste. Still young but already enjoyable. ♣ Gambero Rosso Tre Bicchieri award (their top ranking), 2017. 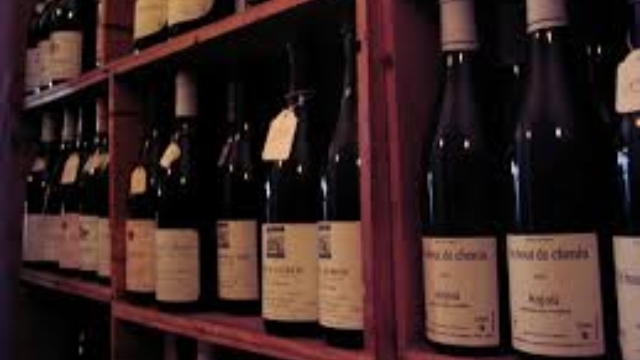 About this award: "Seventy writers and collaborators who have tasted 22 thousand wines of 2,400 companies and over 45,000 bottles, telling it all in almost a thousand pages of volume. The evaluation as always is expressed in glasses, a glass for good wines in their category, two glasses for wines from very good to good, and finally the three glasses, a symbol of excellence." Only about 2% of the tasted wine receive Tre Biccheri. ♦ Rose petal nose; aromatic; lush and floral; juicy, dense, crisp, and long. ♦ [I]t's a beautiful wine with aromatic grapes from South Tyrol, in Italy. ♦ [This wine] would give many top Alsatian wines a run for their money. The grape variety comes from these parts and you could not have a more typical rose water, orange blossom and lychee combination. ♦ The wine itself is a golden yellow, with hints of green and red. It exhibited intense aromas of rose, tropical fruits and lychee. Very fruits and intense, rich and silky, with some acidity to balance everything out. This wine pairs well with fish and white meats, and it slight sweetness is a great foil for spicy foods. ♦ Cantina Tramin is another reliable source. The sleepy village of Termeno/Tramin, for long thought to be the birthplace of the Traminer white grape variety, also known as Gewürztraminer (spiced Traminer) for its heady aroma. Even today Tramin really is very good for Traminer, and has been waking up in response to a discernible fashion for this powerfully scented, full-bodied varietal wine throughout Italy. ♦ [Google-translated from Italian:] Termeno, the Gewürztraminer cradle, dominates the scene along the western shore of Adige and the best vineyards consecrated to this vine have a characteristic reddish yellow color with green shades when they reach full ripeness. The most famous Termeno vineyards are located in the micro areas of Söll (Sella) and Rungg (Ronchi), where the wine becomes rich and silky, mineral and structured, with an elegant and intense aroma of Moscato, rose petals, spices And Oriental fruits like litchi. The Gewürztraminer has become one of the most popular wines, among those produced in South Tyrol. ♦ Dragonfly is sourced from Washington's Columbia Gorge, though labeled simply as a Washington wine. Rich and off dry, it's both floral and fleshy. Big fruit flavors of peach and apricot dominate. 88 points. ♦ The nose of this wine was very compelling, strong and aromatic, and its taste was a complex melange of exotic spice and tropical fruit. It was dry, well balanced, and possessed a lengthy and pleasing finish. A superb example of Gewürztraminer. ♦ [This wine] has a bit of sweetness to balance the classic rose petal and grapefruit character. ♦ [T]his white has the heft and complexity to stand up to curry’s rich multitude of spices. Look for tropical flavors of lychee, guava, and pineapple with floral notes of lavender and roses. ♦ This wine starts out strongly reduced, making it a challenge to get at the pink grapefruit, lychee and spice aromas. The flavors drink just off dry, with high wire acidity. There are good things going on but the reduction is a challenge to overcome. 87 points. ♦ I liked what I saw here. Fat and dry, this shows nice pepper and good weight, excellent varietal typicity and charm. It gets fatter with air and shows some spice and pepper. It's not particularly complex or distinguished, but as new world gewurz goes, this stands out as the real deal. I'd like to see this hold nicely in the cellar for a couple of years, too. 89 points. ♦ With quite low alcohol (12.7%), this Gewürz has a little residual sugar, giving it a rich edge of honey. That's the perfect counterpoint to the pineapple, peach, lychee and Indian spice flavors that are so savory and crisp. Great buy in this exotic variety. 87 points. ♦ The more I taste these Gewürztraminer wines the more I like them. This one is lightly lime tinted, with lemon zest and Lychee on the nose…a medium body with plenty of acidity (bone-dry)… The flavor paralleled the aroma nicely, but it was crisp yet creamy, which seems to be an oxymoron. The finish was fair with just a hint of minerality and ginger. 91 points. ♦ This pretty inexpensive bottle (about $10ish) turned out to be quite pretty and was a favorite of the group. Persimmon, quince, some lychee, and a great florality; really open fruit with a zingy tartness to it. Really nice. ♦ [I]t is a great example of a spicy food friendly wine with its floral nose (do I dab it on my neck or drink it?) and lychee. Plus it is a grape that many people shy away from, mostly due to the pronunciation and that it smells sweet. I t is in fact a dry wine, and it’s absolutely delicious with Thai food. ♦ Much of the gewürztraminer on American shelves and wine lists is Alsatian, and as far as I'm concerned you can have it. A quick tip of the cap to Kenny Likitprakong's sunshine-light (and at $13, startlingly affordable) Banyan 2012 Gewürztraminer from Monterrey[sic] County, Calif.
♦ It is a blend of 98.5 percent Monterey County Gewurztraminer and 1.5 percent Monterey County Chenin Blanc… At 12.7 alcohol, with high acidity, it is well balanced, with a frangipane, almond-lily fragrance. The finish hints at lychee fruit.